How do we learn to tell a satisfying shared story on stage through the medium of an improvised narrative show? How can an ensemble learn to work together to support the story arc and create the best story possible? How do we avoid the ‘boring bits’ of an hour-long format and train ensemble awareness of the shape of the show? This intensive will use Keith Johnstone inspired exercises and techniques to hone participants’ ability to sustain an exciting hour-long narrative show, as well as explore a number of tools to inspire and shake up participants’ scene work skills. Suitable for those looking to develop their storytelling, improvised narrative and scene work skills. 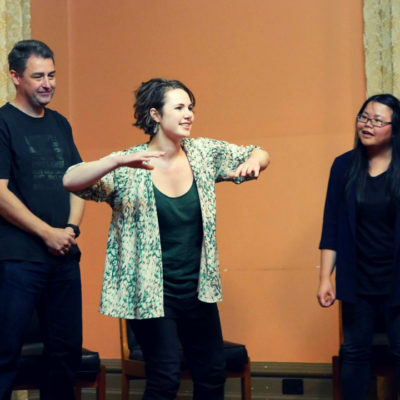 This course is open to performers at all levels but some improv, acting or theatre experience is recommended. What interests you about taking this course, and why? If you have any questions about the course, or the application procedure, please contact Imogen directly. Interested, but tight of pocket? Some concession rates are available. Email Imogen directly with your application, your situation and your reason for needing a concessionary rate and we shall see what we can do.